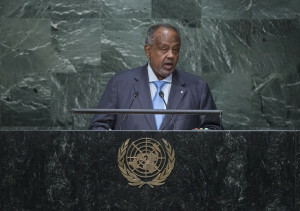 The small coastal country of Djibouti made headlines last month as it was revealed that three-term President Ismaïl Omar Guelleh was scheduled to appear before the British High Court, which would have made him the first ever acting African head of state to do so. While pro-democracy activists in Djibouti and abroad heralded the development as a rare chance to hold a corrupt and authoritarian leader to account, IOG, as the President is called, backtracked as the case began to receive more attention, refusing to make an appearance. The case itself chiefly concerns the fate of Djibouti businessman Abdourahman Boreh, the former Chairman of his country’s Ports and Free Zones Authority – a strategic position that bears witness to his former proximity to the President. Boreh’s closeness with IOG dramatically shifted, however, when he began to officially entertain the prospect of running for President himself. IOG was finishing up his second term, which he had said would be his last, theoretically leaving an opening for Boreh. The tables swiftly turned on the businessman, however, when IOG announced he would pursue a third term as president and Boreh found himself sacked and accused of terrorism – charges that led him to flee his home country. [pullquote]According to testimony given in court, IOG owns 80 cars and a Parisian flat worth €2.24 million, all on an official salary of $5,000 a month. [/pullquote]Boreh’s trial, which also took place in London under the authority of Justice Flaux, was tossed out in March when a lawyer on Djibouti’s legal team was accused of deliberately withholding evidence which exonerated Boreh. Justice Flaux went as far as to claim that “Djibouti has not come to the court with clean hands.” Determined to pursue his erstwhile ally and current political rival, IOG’s regime is now throwing the kitchen sink at Boreh and suing him on corruption charges. Beyond the particulars of trials though, the Djibouti v Boreh cases illustrate many of the troubling trends currently facing the African continent. As American President Barack Obama noted on his recent tour of Africa, an encroaching “third-termism” is threatening many of the continent’s fragile democracies, from Burundi to Congo-Brazzaville. Becoming President of many African nations means having unimpeded and virtually limitless access to state coffers, as long as one pays the right people. African Presidents have accordingly used their position to build sprawling patronage systems that span the public and private sectors. Such a system thrives on the status quo, while the President’s power and financial security lies in retaining his position. In Djibouti, IOG has taken third-termism one step further, as he is now gearing up for an unprecedented fourth term in Djibouti’s 2016 elections, and by all accounts has vastly profited from his long tenure. According to testimony given in court, IOG owns 80 cars and a Parisian flat worth €2.24 million, all on an official salary of $5,000 a month. Despite his largesse, however, IOG has not only avoided the official scorn of the Obama administration but was even honoured with a visit to the White House in May 2014. The reason for this is simple. Sandwiched between Ethiopia, Eritrea and Somalia on the Horn of Africa, Djibouti is located in a strategically important position, militarily and economically. Devoid of any natural resources, the nation’s leaders have lined their pockets by renting out their land to the highest bidder, and currently host American, French EU and Japanese military bases. A similar Chinese installation is also in the works. The American base, Camp Lemonnier, is the only permanent US military base in Africa, making good relations with the Djibouti regime a priority. [pullquote]Sandwiched between Ethiopia, Eritrea and Somalia on the Horn of Africa, Djibouti is located in a strategically important position, militarily and economically. [/pullquote] In May 6, 2015, US Secretary of State John Kerry made history by stopping in Djibouti during his travels throughout the wider region. The trip, where he “met with high-level leaders to discuss […] bilateral cooperation”, marked the first ever visit by an acting Secretary of State to Djibouti. This honour was bestowed despite the fact that another representative of the US State Department referred to Djibouti as “less a country than a commercial city state controlled by one man, Ismail Omar Guelleh” in a confidential cable revealed by Wikileaks. Although it should always be assumed that there is considerable divergence between a state’s official communications and actual strategy, the hypocrisy in the United States’ dealings with Djibouti remain stunning. Given the impunity that IOG enjoys in his home country, the Boreh trial shows that pressure on African leaders for accountability are unfortunately more likely to come from abroad. For better or for worse, African leaders still care about the image they project internationally, suggesting that if Western nations were more consistent about their naming and shaming campaigns, external pressure for greater accountability in Africa could move things in the right direction. As usual, though, ‘great powers’ like the United States are their own worst enemies in delivering a firm message to their partners overseas. While it now looks like IOG will not make history by subjecting himself to the authority of a British court, the whole ordeal looks like it will at least have the incidental positive effect of shining a light into the web of corruption and tyranny that Djibouti’s population has suffered from for so long. Perhaps the affair could even lead Western populations to demand less hypocrisy from their own leaders. At the end of the day, more accountability and transparency on both sides of the world could only be welcomed.